Please come along (and invite your friends) to our WaterAid Quiz Night on Thursday 16th April 7:30pm at Kennet Valley Free Church for a fun filled evening in support of WaterAid. The Quiz Master will be our very own Ant “Sheikh-A-Leg” Tyler. He is well experienced at running quizzes, not to mention running marathons! There will be 10 rounds of 10 questions and a short presentation on WaterAid and their work. The cost will be £10 per team with a maximum of 4 per team (and all donations welcome). All proceeds will go to WaterAid via Humphrey and the Thames Water marathon teams fund-raising efforts in the London Marathon 2015. If you would be so kind as to sign up via http://bit.ly/quiznight_wateraid_form or in the Church foyer or if you are really afraid of forms then why not just surprise us all and turn up on the night! Everyone is welcome! Humphrey is running the London Marathon 2015 on 26th April 2015 to raise money and support for WaterAid projects in Bangladesh. As part of his training Humphrey would like to invite families and individuals to join him on one of his favourite scenic 4.3 mile training routes along the river from Pangbourne to Goring on Saturday the 11th April 2015 (couple of weeks away! It will be an adventure walk with lots of banter and fun along the way, it will be a great day out for the whole family. I’d love it if you could join Humphrey and all his furry friends for the walk. Humphrey will be walking in both directions, so if you can make the morning then walk Pangbourne to Goring or join in for the afternoon leg from Goring to Pangbourne. Humphrey is not expecting you to walk both ways (unless you wish to) but it does provide options so you can plan your Saturday around the walk. Timings Mr Camel: where do I need to be, by when? 9:30 – 9:45: Meet on the Pangbourne Meadow in front of the Adventure Dolphin Centre (RG8 7DA). Look out for the WaterAid signs and the furry Camel! 12:30 – 13:30 Goring Free Church refreshments and cakes. Rest weary legs and learn about WaterAid’s work and the need for clean water and sanitation. This will be an interactive session with plenty of fun learning materials. Those who wish to join us on the afternoon walk can meet us for the teas and talk, and those who have walked the first leg can depart after the refreshments. The River Thames, Whitchurch Bridge, Red Brick Bridges, Railways, Horses and Camels and plenty more! How tough is the walk? What route are we walking? Can I leave my kids with you and go shopping? Unfortunately not. Camels do not have peripheral vision and will not be able to keep an eye out for all the children (and rogue children tend to pull Humphrey’s tail!). Children do need to be accompanied by a responsible adult. We are encouraging families to walk together. Whilst there is no fixed cost, Humphrey is hoping that you will be very generous in raising money to support WaterAid. WaterAid Sponsorship Form – download the sponsorship form, to enable you to collect money from friends and family for your Walk “Fur” WaterAid. Tell all your friends and family why you are walking and ask for their support. People are very generous, don’t be afraid to ask! 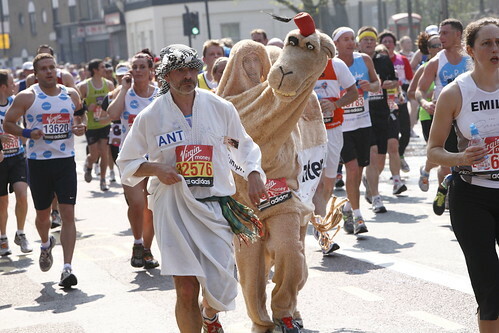 You can bring the sponsorship money on the day of the walk, or donate online via Virgin Money Giving – Humphrey the Camel, London Marathon 2015 . Thank you for your support. If you have no money to give then come and help us collect along the way. WaterAid Bangladesh. There are 5 villages in particular we are currently raising money for that require water and sanitation schemes. You can read all about them here Why Bangladesh needs our help? Thames water will be match-funding the money we raise. So your money will go even further! How will I get between the start and the finish? Sign up by filling in the form below or clicking the link here http://bit.ly/walkfurwateraid_signup. Fill in the form and state how many people will be walking and which section you intend to walk. Sure, send your email to walk4wateraid@humphreythecamel.org please include the number of adults, teenagers and children that will be walking and which leg you wish to walk. This will help with planning and catering. Thanks to everyone who cheered and donated on the day. You too can lend your support by donating online (please consider it if you can). I am raising money for water and sanitation projects in Bangladesh. All donations will be match funded by Thames Water, so it’s s a great investment opportunity! Where else can you get a 100% return for your hard earned cash? It would make a real difference and lasting impact for a village in Bangladesh. Thanks so much Virgin Money Giving – Humphrey’s sponsorship page for WaterAid. Plenty of photos and selfies! Fantastic crowd support right round the course!